This chapter focuses on the role that mobile technologies play in health, particularly with regard to how the ubiquity of mobile telephony is reshaping health and creating new possibilities for a healthier future. Although mHealth and eHealth are readily grouped together and are closely linked, mHealth offers a unique opportunity to strengthen eHealth (Vital Wave Consulting, 2009) through its communications and mobility capabilities and broader reach into the general population. 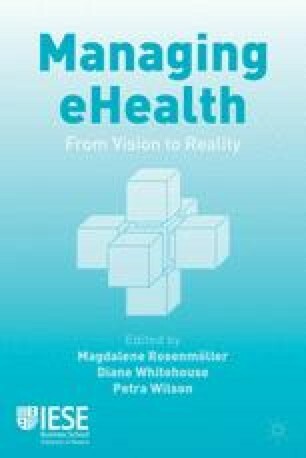 In order to provide a holistic understanding of the current and future states of mHealth, this chapter begins with a brief description of the importance of communication through history and how mobile technologies offer an instant form of communication to the modern-day world. The current state of mHealth is then illustrated through a number of examples of ways in which mHealth can be used as a tool for improving healthcare and health systems, as well as a description of primary actors within the increasingly interconnected ecosystem of mHealth. Based on the current state of mHealth, recommendations are then provided for the field on how various areas should move forward to most effectively achieve mHealth’s full potential. All experience, knowledge and lessons learned are provided from the perspective of the mHealth Alliance (referred to as the Alliance), which is hosted by the United Nations Foundation (www.mhealthalliance.org). BBC Media Action (2013), Empowering community health workers in Bihar: Mobile Academy and Mobile Kunji, http://www.bbc.co.uk/mediaaction/where_we_work/asia/ india/india_sdp_empowering_chw_ma_mk.html. [Accessed 1 November 2013]. Hartung C., Anokwa Y., Brunette W., Lerer A., Tseng C. and Borriello G. (2010), Open Data Kit: Tools to Build Information Services for Developing Regions. Paper presented at the International Conference on Information and Communication Technologies and Development (ICTD 2010), London, December 2010. See: http://opendatakit.org/wp-content/uploads/2010/10/ODK-Paper-ICTD-2010.pdf. [Accessed 1 November 2013]. mHealth Alliance (2012), Annual Report. See: http://www.mhealthalliance.org/media-a-resources/annual-report. [Accessed 1 November 2013]. Mondato, L.L.C. (2013), Can mobile money enhance access to healthcare? http://mondato.com/en/articles/can-mobile-money-enhance-access-to-healthcare. [Accessed 1 November 2013]. SunStar Manila (2012, March 15), Text2Teach connects students to a more interactive learningenvironment. See http://www.sunstar.com.ph/manila/local-news/2012/03/15/ text2teach-connects-students-more-interactive-learning-environment-2113. [Accessed 1 November 2013]. UNICEF Innovation, Project Mwana (2013), http://www.unicefinnovation.org/projects/ project-mwana. [Accessed 1 November 2013].